For nearly a decade the KDE project has created award winning and critically acclaimed Free software which has found its way onto millions of computers and into the hearts of people from around the world. Over this time we have also come to expect an increasing level of continuity from every aspect of the project: software and interface design, art direction, public relations, industry involvement. Expressing such harmony in our creative efforts sounds like a reasonable goal but actually achieving it can be challenging for a project as large, varied and well established as KDE. It may also be a key to long term success and sustainability. It requires that we possess an understanding of who and what KDE is, what we want to become, why this is useful knowledge and what we intend to do with it. Our exploration begins by asking fundamental questions about core values, cultural identity and shared goals. Together we will find the answers that lie right in front of and within each of us individually and collectively. Aaron Seigo is a KDE developer, KDE e.V. board member, public speaker and writer who has has been involved with KDE since shortly after the 2.0 release and with the software industry in general since the early 1990s. 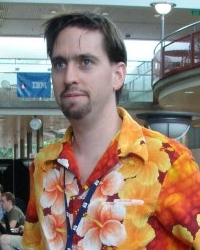 He has centered his career and efforts around Free Software as it is one of his central interests and motivators.